What’s the first thing you think of when you think of Sicily? OK then, what’s the second thing you think of? My guess it’s FOOD. Maybe classic Sicilian savoury specialties such as arancini di riso (rice balls), crespelle (soft fritters usually filled with ricotta cheese), scacciate (little pies filled with cheeses, anchovies and vegetables), or some of the many simple and delicious seafood based dishes. Or perhaps the most famous dish of Catania, on Sicily’s east coast, Pasta alla Norma. 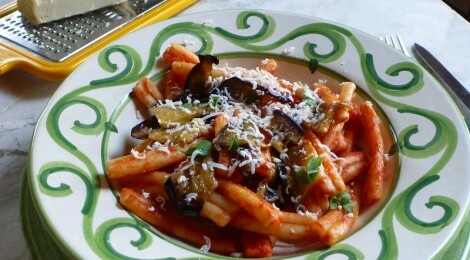 Traditionally, Pasta alla Norma incorporates melanzane (eggplant), garlic, basil, tomatoes and salted ricotta (a semi hard ricotta), with pasta, usually spaghetti or sometimes penne. And a good Pasta alla Norma is to die for. A true local Catanese establishment, Dea Bendata combines good food at a reasonable cost and entertaining family distractions. Guests feel they are being invited into a family home or a private, though noisy, club: we are of course the only stranieri there. It’s dance night. After our meal we glide out to the ballroom where a three piece band plays for traditional Sicilian group dancing, somewhat surprisingly interspersed with snippets of fox trot, Gay Gordon and cha cha. All romantically and competently executed. Although maybe that’s not quite the best verb to bandy about in Sicily. On our second evening we dine a table away from Angela’s first communion celebration. And such a family festivity of course comprises at least three generations, cousins too numerous to count, and much merriment. Angela’s twenty-five guests enjoy themselves no end, and a spot of karaoke contributes to the entertainment. Yes, we could eat in a quieter part of the restaurant: but do we want to miss this cultural opportunity? Amid this revelry, excellent local food is served. The pizzaiolo in the far corner is multitasking: throwing and swirling his pizza dough whilst singing along with karaoke or DJ, chatting with his customers and friends, and tending his oven. But instead of pizza we choose the best ever authentic Pasta alla Norma. So who is this Norma? It’s a long story…..
Vincenzo Bellini, Catania’s most famous son, was born in 1801. A child prodigy from a musical family, at the age of 18 he left Catania to study at the conservatory in Napoli. A curly blond haired, blue eyed, tall and slim young man, he stood out from the crowd in more ways than one: he started his life’s work of composing operas. From 1827 he lived in Milano. Giuditta Pasta (her real name) was an acknowledged passionate soprano opera singer of the day with tremendous dramatic and vocal strengths, and a favourite of Bellini: he wrote an opera with her as inspiration for the heroine and with the intention of Signorina Pasta being cast in the lead role. And so she was. Bellini’s ninth opera with the predictable opera recipe of romance, jealously, betrayal, love triangles, murderous intent and spectacular deaths premiered in La Scala on Boxing Day 1831. Although Bellini was said to have wept with disappointment at the unspectacular world premiere of Norma, the opera soon after received astonishing acclaim. Back to the origin of Pasta alla Norma. Many versions float around Sicilia, as to how this typical Catanese dish got its name. I’ve culled these stories to two, and added one of my own. First: The simplest explanation. Was a Signora Norma, resident of Catania, the first person in this city to make a pasta sauce from melanzane and pomodori? Second: Was Sicilian poet Nino Martoglio so impressed with his first taste of the amazing pasta dish that he compared the food’s magnificence with that of Bellini’s magnificent opera? “Questa pasta e una Norma!” he declared, maybe. Third: I rather like this one, although conceivably it is a little too imaginative. Bellini’s favourite singer, Signorina Pasta (perhaps known locally as “La Pasta” as is the Italian way with names), was the inspiration not only for the Norma lead role, the whole opera, but also for his food. Thus Norma alla Pasta. Although changing it slightly to Pasta alla Norma sounds so much better. Bellini’s life was short. He died at 33, near Paris, although his remains were soon after returned to the city of his birth and are now ensconced in the Catania cathedral. Major city monuments to the composer include the grand Bellini Gardens – many avenues, hedges, fountains and statues, providing a relaxing spot in the vibrant busy city – and the impressive Teatro Massimo Bellini. This imposing 12,000 seat theatre with five tiered boxes, and excellent acoustics, opened in Catania in 1890 with a performance of, you guessed it, Bellini’s Norma. Maria Callas, Luciano Pavarotti, Mario Del Monaco are among the illustrious who have since performed there. Callas in fact made the tormented Druid Priestess Norma her specialty role, with 89 stage performances. And the Bellini cocktail? Also inspired by the composer? No, that’s another Bellini – Giovanni Bellini, 15th Century Venetian artist, whose use of a delicate pale pink in his paintings was the inspiration for Giuseppe Cipriani’s 1934 invention at Harry’s Bar in Venice using prosecco with pureed white peaches. By the way, Catania’s symbol since the 1200s, the elephant, has nothing at all to do with Bellini – or Norma – as far as I can find. But I’m working on it.